Prepare yourself for eye popping Guardians, incredible Ms. Marvels, the whole Spiderverse, and lots lots more. Dragoncon 2014 is long since past us, but don't think I'm not still thinking about it. The beautiful city of Atlanta. The amazing cosplay. The heat and humidity. Oh god it was terrifyingly hot. But also the great cosplay, and speaking of, I still haven't shown you even a fraction of the cosplay creations I saw on the scene. But today, I'm going to begin making up for that. 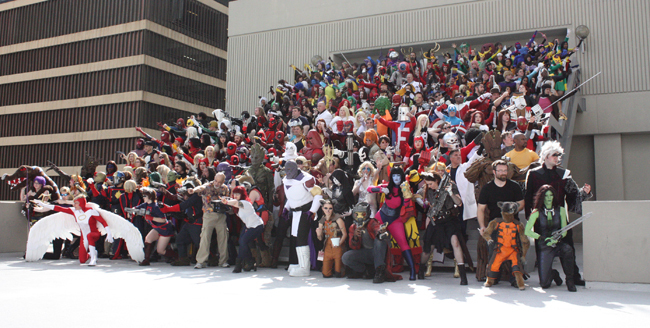 Related: Be sure and check out our previous coverage of Dragoncon 2014 here. Below, you'll find out favorite costumes from the Marvel universe. Trust me when I tell you that they were as intricate - and incredibly thick and bulky - as they appear. These people really did suffer for their art, but we get to reap the rewards, so thanks, guys! First up, here's the entire Marvel universe from the Marvel photo shoot.